MSA 30X the discreet sound amplifier. MSA 30X the discreet sound amplifier. Don&apos;t be embarrassed by large, unsightly amplifiers. 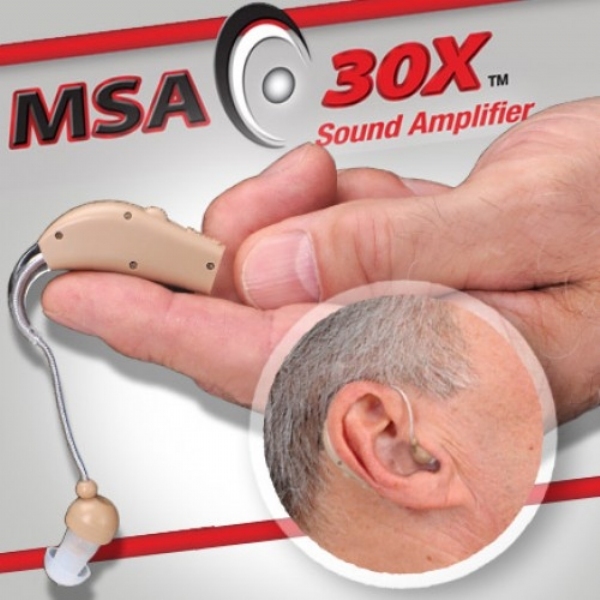 MSA 30X, as seen on TV, is a discreet sound simplifier that is lightweight and comfortable. The MSA30X magnifies sound up to 30 times! The clear tubing of MSA 30X fits the contour of the ear making it almost invisible. Enjoy a movie or show without missing a word, have conversations with friends in a crowded restaurant without struggling to hear. The MSA 30X is rechargeable saving you money on batteries. Fits right or left ear, has adjustable volume control and is FDA listed. Includes MSA 30X device, 6 silicone ear buds, charging cradle, adapter and cleaning brush. Buy the MSA 30X today! I broke the hearing aid for my left ear and despite concerns about the MSA 30X being a rip-off, a friend bought one for me, and PTL! The 30X works every bit as well if not better than the high priced hearing aid that cost boccu bucks more! Yes, I&apos;m quite immpressed, good product. I use this sound amplifier to help me hear well at work. I work as a hostess at a local restaurant. So far, so good. The sound are pretty good and loud. However, the wire that connects the earbud to the actual amplifier is too long and I hate the fact I can&apos;t do anything to shorten the wire so that it can fit on my ear!! I had to use bobby pins and an elastic band to hold my amplifier to my ear. I can say it&apos;s definitely an attraction to customers!! Please do something about that. Otherwise, it&apos;s pretty okay. I purchased this item for a dear friend. He lost lots of his hearing due to his work. It was very frustrating having any conversations with him. Also, my friend wasn&apos;t able to hear noises that were extremely obvious. Now, I&apos;m the one that hears him say Did you hear that? Thank you for a wonderful product and for giving my friend a new outlook on life. I was skeptical, but they work so well, that I bought another pair to make sure in case I loose one. I am sight challenged and lost my expensive doctor prescribed hearing aids. These work so well, that I am not going back to the doctor. Sound quality is outstanding. Definitely makes a difference in hearing people talk. It works! If I turn it all the way up, I can hear people talk about a mile away. But I also pick up all the background noise, which makes it difficult to hear conversation. I use the audio enhancer when watching TV. It&apos;s easy to wear but the wiring is very fragile. Purchased for my mom who currently has a very expensive hearing aid that eats batteries and is hard to use. She uses these aids for watching TV and thinks that they are very helpful. The charging feature is wonderful. No batteries to buy. Would recommend. Works great but the wire is so cheap it breaks after a few months and stops working, so my mother has to keep buying new ones. She&apos;s been through several for this reason. Even if you just use simple to operate hearing amplifier as a inexpensive t.v. ears, this product is worth far more than its cost.However, It can also function as a simple hearing aid. These hearing aids work better than the ones I spent thousands of dollars on!!! Very happy with them!!! I&apos;m very disappointed with as seen on TV. This product was for my mother. We waited weeks to even get the product. The product itself is horrible and certainly doesn&apos;t work the way it was promoted. The product was to loud and the volumn wouldn&apos;t turn down other then that it would be worth the money. The amplifier is very good; for some reason I have trouble keeping it in my ear when moving my head around. Already had one, needed another, and couldn&apos;t find it on T.V. anymore.